Margaret Hilda Thatcher (née Roberts), Baroness Thatcher of Kesteven, LG, OM, PC (born October 13, 1925. died April 8, 2013), was Prime Minister of the United Kingdom from 1979 to 1990, and the first woman to hold the position. Her leadership permanently moved Britain to the right and reshaped the nation's political environment to stress economic growth and international competitiveness. The Labour Party in response under Tony Blair jettisoned their old leftist ideas and followed Thatcher-lite programs. Despite being in power for 13 years from 1997 to 2010 Labour did not remove any of Thatcher's anti-union legislation and has refused to even consider doing so. Thatcher was chosen to be the leader of the Conservative Party in February 1975, succeeding former Prime Minister Edward Heath. She was opposed to socialism and excessive union power which had brought down the previous Conservative government in 1974. She led the Conservatives to victory in the May 1979 General Election and thus became Prime Minister. Thatcher sold many of the UK's nationalized industries back to private investors and made tax cuts. She broke the power of the trade unions which stood in the way of industrial progress, especially in the mining, print and shipbuilding industries and the public sector. Due to her strong standards and her leadership style, she became known as the "Iron Lady," a term originally coined as an insult in the Soviet Army newspaper Krasnaya Zvezda (Red Star,) but one she adopted enthusiastically. A famous statement of hers was "You turn if you want to, but the lady's not for turning", in reference to calls from within her own party to back down (in the political terminology of the time, "U-turn") on issues that were important to her. Thatcher was always a strong supporter of close relations with the United States and was a good friend of President Ronald Reagan, uniting with him in actions against the Communists. She led Britain to victory against Argentina in a 1982 war over Argentinian aggression against the Falkland Islands. The United States was allied with both countries, and initially tried to broker a negotiated settlement. When Thatcher rejected the proposed compromise, the U.S. supported Britain with intelligence information and the supply of advanced AIM-9L Sidewinder missiles. The conflict led to a strong friendship with the Chilean leader Augusto Pinochet after Chile helped Britain in the conflict. In 1986, she banned the promotion of homosexuality in schools in a piece of legislation known as Section 28. Thatcher led the Conservative Party to victory in three general elections (1979, 1983 and 1987). By 1990, her popularity was waning and there were calls from within her own party for her to step aside. She was challenged for the party leadership and just failed to gain the necessary majority in the first election despite getting more votes than her rival Michael Heseltine. After being convinced by colleagues that she would narrowly fail to gain the necessary votes she decided not to stand for a second ballot and resigned as party leader on 22 November 1990. John Major won the party leadership vote, and was subsequently appointed to succeed Thatcher as Prime Minister. Heseltine's reputation was destroyed by his actions and his career in the Conservative Party slowly declined, although he remained in the British government and was Deputy Prime Minister between 1995 and 1997..
Thatcher was the longest serving British Prime Minister in more than 150 years and, alongside Winston Churchill, is considered to be one of the two most important British political leaders of the twentieth century. The predominant influence in Lady Thatcher's early life was her father, Alfred Roberts. Roberts was a grocer by occupation who was active in local politics. She attended Somerville College, Oxford, where she read chemistry and became chairman of the university Conservative association. After graduating, she worked for a time as a research chemist before qualifying as a barrister and practicing as a tax lawyer, an indication of her interest in financial matters. In this time period, it was uncommon in Britain for a woman from a background to go to an upper-class university and then to pursue a career in the elitist male world of the Bar. Lady Thatcher married Denis Thatcher, a successful businessman whom she met at a Conservative Party meeting; a quiet man, he kept out of the spotlight. They had two children, twins Mark Thatcher and Carol Thatcher. Margaret Thatcher as Leader of the Opposition in 1975. Though at the time she was a relatively untested figure (and many in the party were wary of choosing a woman leader), she defeated both Heath and other male rivals in the contest in February 1975. Heath subsequently became a prominent personal and political adversary of Thatcher, drawing accusations of bitterness. In the 1970s, Thatcher's strongly conservative, pro-capitalist stance resonated with a new mood among the British electorate, many of whom had become dissatisfied with the post-World War II statist consensus (the "post-war consensus", sometimes also called "Butskellism" after the centrist Conservative politician Rab Butler and the moderate Labour politician Hugh Gaitskell). Thatcher and the Conservatives offered a clear alternative vision for an increasingly aspirational society. The Conservative politician Sir Keith Joseph was the primary intellectual force behind these theories that later became known as Thatcherism. They were strongly influenced by the pro-market intellectuals Friedrich von Hayek and Milton Friedman. Thatcher, throughout her parliamentary career, voted in favor of liberal abortion laws. The Labour party under James Callaghan (prime minister 1976-79) contested the May 1979 election as unemployment passed the one-million mark and unions became more aggressive. The Conservatives used a highly effective poster created by Saatchi and Saatchi, showing a dole queue snaking into the distance and it carried the caption "Labour isn't working". Voters gave Conservatives 43.9% of the vote and 339 seats to Labour's 269, for an overall majority of 43 seats. People generally voted against Labour rather than for the Conservatives. Labour was weakened by the steady long-term decline in the proportion of manual workers in the electorate. Twice as many manual workers normally voted Labour as voted Conservative, but they now constituted only 56% of the electorate. When Harold Wilson won narrowly for Labour in 1964, they had accounted for 63%. Furthermore, they were beginning to turn against the trade unions—alienated, perhaps, by the difficulties of the winter of 1978-9. In contrast, Tory policies stressing wider home ownership, which Labour refused to match. Thatcher did best in districts where the economy was relatively strong and was weaker where it was contracting. Thatcher's chief goals in power were to reverse Britain's economic decline and to reduce the range of the state as well as standing taller on the international stage. She found a soul-mate in Ronald Reagan, elected in 1980 but whom she had met in 1975. Thatcher started by increasing interest rates to drive down inflation which hit the manufacturing sector and caused unemployment to rise sharply and there was a deep recession in the early 1980s blamed on her Government's economic policy. This led to her famous quote: 'the lady is not for turning', and she refused a policy reversal and, despite an open letter from 364 "economists", taxes were increased in the middle of a recession. Although unemployment did not reach 3 million till 1982, a year earlier British cities burned as thousands took to the streets to demonstrate their frustration. Inflation was going down though, allowing interest rates to fall, proving those "economists" wrong. As the economy started to recover Argentina invaded the Falklands, the first (and unprovoked) invasion of sovereign British territory by a foreign government since the Second World War. This invasion was preceded, and possibly encouraged, by her withdrawal of the Royal Navy's Antarctic patrol ship HMS Endurance from the South Atlantic. Thatcher immediately declared her resolve to recapture the islands in line with the wishes of their inhabitants, and dispatched a naval task force to that end. With help from President Pinochet of Chile and, more covertly, Ronald Reagan, the British forces swiftly recaptured the islands. The resulting wave of patriotic enthusiasm as well as her right to buy policy for council homes, and a uselessly divided opposition, meant she got a landslide victory in the June 1983 general election. The central theme of Thatcher's second term was reducing the power of the trade unions with a series of measures that a number of unions reacted to with industrial action. In particular action was initiated by the National Union of Mineworkers led by Arthur Scargill, who openly declared the intention of bringing down the elected government. The Tories had prepared for the strike by building up coal reserves and deploying police units fitted out with new riot gear brought in after the disturbances of 1981. The miners responded with violence and very ugly scenes developed on picket lines that split the country. Scargill's failure to hold a ballot for the strike undermined public support and the striker's chant of 'vote with your feet' calling miners to join the strike was turned on them as more and more returned to work over the year of the strike. In the middle of the strike, on October 12, 1984, the Provisional IRA (Irish Republican Army; a terror group that seeks Irish Reunification) detonated a bomb during the Conservative Party conference in Brighton. Thatcher escaped injury but five people died in the attack and Margaret Tebbit was left paralyzed; the conference went on as normal. Thatcher delivered a speech less than four hours after the explosion. Thatcher's political and economic philosophy emphasized free markets and since gaining power she had experimented in selling off nationalized industries starting with the National Freight company, most of the large utilities followed. Privatization was perhaps the most enduring legacy of the political economy developed under Thatcher. She privatized long-nationalized corporations (such as the telephone and aerospace firms) and, most important, sold public housing to tenants, all on favorable terms. Theis turned Labour-minded tenants into Conservative-minded property owners and mortgage payers. The policy developed an important electoral dimension during the second Thatcher government (1983–90). It involved more than denationalization: wider share ownership was the second plank of the policy, and this provides an important historical perspective on the relationship between Thatcherism and 20th century conservatism. Thatcher supported Reagan's Cold War policies of rollback of Communism. She supported the stationing of nuclear missiles in Europe and at British bases, ignoring the last-gasp protests by the Campaign for Nuclear Disarmament. She supported the American bombing raid on Libya from bases in Britain in 1986 and, by refusing to side with a European consortium, in backing the American-based Sikorsky Aircraft Corporation over a British company Westland. Michael Heseltine resigned in protest at her style of leadership over this. In 1984 she visited China and signed the Sino-British Joint Declaration with Deng Xiaoping that agreed the handover of Hong Kong in 1997. At the Fontainebleau summit in 1984 Thatcher argued that the UK paid far more to the EEC than it received in spending and negotiated a budget rebate using the argument that ‘We want our money back’. 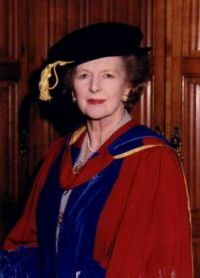 In 1985, the University of Oxford voted to refuse her an honorary degree in protest against her cuts in funding for education. In 1987, Thatcher became the first British Prime Minister to win three consecutive general elections since Lord Liverpool (1812-1827). In the late 1980s Thatcher began to be concerned by environmental policy and in 1988 she made a major speech accepting the problems of global warming, ozone depletion and acid rain. However, in her Autobiography, she has told her readers that she regretted what she said in the 1980s and that she thought: "Global Warming provides a marvellous excuse for global socialism" showing her change from a liberal attitude towards Global Warming to a Conservative one. At Bruges, she made a speech in which she outlined her opposition to proposals from the European Communities for a federal structure and increasing centralization of decision-making believing that the role of the EC should be limited to ensuring free trade and effective competition. She was specifically against Economic and Monetary Union, through which a single currency would replace national currencies, and for which the EC was making preparations. In 1989 the economy high interest rates were imposed to stop an unsustainable boom. At the Madrid European summit, Nigel Lawson and Geoffrey Howe forced Thatcher to agree the circumstances in which she would join the Exchange Rate Mechanism, a preparation for monetary union. She took revenge on both by demoting Howe and listening more to her adviser Sir Alan Walters on economic matters. Lawson resigned that October and in November, a so-called ‘stalking horse candidate Sir Anthony Meyer challenged Thatcher for the leadership of the Conservative Party. In 1989 a new system of local government finance to replace the rates was introduced for Scotland in 1989 and for England and Wales in 1990. Called the 'Community Charge' but known as the Poll Tax was applied at the same amount to every individual resident with only limited discounts. Widespread opposition culminated in a huge demonstration in London on March 31 that turned into the largest outbreak of public disorder central London had seen in a century which was followed by millions of people refusing to pay the tax. This along with her government's handling of the economy, her perceived arrogance and a general feeling that she would never retire, made her politically vulnerable. Geoffrey Howe resigned on November 1 and condemned Thatcher's policy on the European Communities then openly invited 'others to consider their own response'. Michael Heseltine's response was a leadership challenge which resulted in a narrow failure, by two votes, for Thatcher to win automatic re-election. After consulting with cabinet colleagues she found a vast majority thought that she could not win on the second ballot. On November 22nd Thatcher announced that she would not be a candidate in the second ballot. She supported John Major as her successor, and retired from Parliament at the 1992 election. After leaving the House of Commons, Thatcher was dubbed Baroness Thatcher of Kesteven and entered the House of Lords. Denis Thatcher was given a Baronetcy, which ensured that their son, Mark, would inherit the title of "Sir Mark". Before Thatcher became an MP, she worked as a research chemist for British Xylonite and then Lyons & Company, where she helped develop methods for preserving ice cream. Family: Margaret Thatcher is the younger of two daughters. She often gave her father as an example of an outstanding citizen. She married Sir Denis Thatcher, and has one son and one daughter. Interests: Music, art, opera and reading. Denis Thatcher, as the first male PM spouse in history, was always likely to be the center of media attention - and he didn't disappoint. When she met him, Baroness Thatcher remarked that "it was clear to me at once that Denis was an exceptional man - he had a certain style and dash." Described as a man of integrity, humor and common sense, he had a strong business background and fought with the Royal Artillery during the war. It was said that Denis was in 'the Thatcher party not the Tory party'. He once famously remarked, recalling the words of Mark Twain, that: "it's better to keep my mouth shut and be thought a fool rather than open it and remove all doubt." When he died in 2003 his wife paid tribute to the man she loved by saying: "Being PM is a lonely job. In a sense, it ought to be - you cannot lead from a crowd. But with Denis there I was never alone. What a man. What a husband. What a friend." "You have to win the argument before you can win the election." "The lady is not for turning." "I have made it quite clear that a unified Ireland was one solution that is out. A second solution was a confederation of two states. That is out. A third solution was joint authority. That is out-that is a derogation of sovereignty." " There is no such thing as society. There is living tapestry of men and women and people and the beauty of that tapestry and the quality of our lives will depend upon how much each of us is prepared to take responsibility for ourselves and each of us prepared to turn round and help by our own efforts those who are unfortunate"
"Unless we change our ways and our direction, our greatness as a nation will soon be a footnote in the history books, a distant memory of an offshore island, lost in the mists of time like Camelot, remembered kindly for its noble past." "It will be years before a woman either leads the Conservative Party or becomes Prime Minister. I don't see it happening in my time" (in 1970.) This quote was parodied in the 2006 TV series Life on Mars, when DCI Gene Hunt (speaking in 1973) stated "There'll never be a woman Prime Minister as long as I have a hole in my ar*e."
(Referring to her friend and adviser William Whitelaw) "Every Prime Minister needs a Willie." "I like Mr Gorbachev, we can do business together." "I am not sure what is meant by those who say that the Party should return to something called "One Nation Conservatism". As far as I can tell by their views on European federalism, such people's creed would be better described as "No Nation Conservatism"." "Sir Edward Gibbon, author of The Decline and Fall of the Roman Empire, wrote tellingly of the collapse of Athens, which was the birthplace of democracy. He judged that, in the end, more than they wanted freedom, the Athenians wanted security. Yet they lost everything - security, comfort, and freedom. This was because they wanted not to give to society, but for society to give to them. The freedom they were seeking was freedom from responsibility. It is no wonder, then, that they ceased to be free. In the modern world, we should recall the Athenians' dire fate whenever we confront demands for increased state paternalism." King, Anthony. "The Outsider as Political Leader: the Case of Margaret Thatcher." British Journal of Political Science 2002 32(3): 435-454. Issn: 0007-1234 Fulltext: CUP and Jstor. Thatcher was a social outsider, psychological outsider and political outsider. Dellheim, Charles. The Disenchanted Isle: Mrs. Thatcher's Capitalist Revolution. (1995) 352 pp. Haseler, Stephen. The Battle for Britain: Thatcher and the New Liberals. (1990). 195 pp. Holmes, Martin. The First Thatcher Government, 1979-83: Contemporary Conservatism and Economic Change (1985); Thatcherism: Scope and Limits, 1983-87. (1989). 174 pp. a sympathetic assessment. Johnson, Christopher. The Grand Experiment: Mrs. Thatcher's Economy and How It Spread. (1993). 341 pp. Kavanagh, Dennis. Thatcherism and British Politics: The End of Consensus? (1987). 334 pp. Krieger, Joel. Reagan, Thatcher, and the Politics of Decline. (1987). 247 pp. Moon, Jeremy. Innovative Leadership in Democracy: Policy Change under Thatcher. (1993). 157 pp. Pugliese, Stanislao, ed. The Political Legacy of Margaret Thatcher. (2003). 419 pp. Reitan, Earl A. The Thatcher Revolution: Margaret Thatcher, John Major, and Tony Blair, and the Transformation of Modern Britain, 1979-2001. (2003). 260 pp. Reitan, Earl A. Tory Radicalism: Margaret Thatcher, John Major, and the Transformation of Modern Britain, 1979-1997. (1997). 222 pp. Riddell, Peter. The Thatcher Decade: How Britain Has Changed during the 1980's. (1989). 236 pp. Roy, Subroto and Clarke, John, eds. Margaret Thatcher's Revolution: How It Happened and What It Meant. (2005). 209 pp. Sharp, Paul. Thatcher's Diplomacy: The Revival of British Foreign Policy. (1997). 269 pp. Smith, Geoffrey. Reagan and Thatcher. (1991). 285 pp. Waine, Barbara. The Rhetoric of Independence: The Ideology and Practice of Social Policy in Thatcher's Britain. (1992). 172 pp. Walters, A. A. Britain's Economic Renaissance: Margaret Thatcher's Reforms, 1979-1984. (1986). 200 pp. Clark, Alan. Mrs. Thatcher's Minister: The Private Diaries of Alan Clark. (1994). 421 pp.